Thanks you for your mail. How are you doing? My name is Miss Becky Evans, 24 years old, single and never married, first daughter of late. Late Dr Peter Evans, who was until his unfortunate death President/chief executive officer of Talorbenson Petroleum Company Ltd situated in Southern part of Monrovia in Liberia; but before the incident, I was an undergraduate of A.M.E. Zion University, Monrovia student International Relations. I hope you will not be discouraged with this news, I am an orphan residing in a refugee camp as a result of the war that occur in my country Monrovia in Liberia some years ago, in which all my family members were killed by the rebels when they attacked our house. And luckily for me I was in the school when the incident happened which is why I was able to escape been killed along with my family members. Seeing the dangers in staying in my country with my step mother I had to escape to a west African country called Senegal where I was admitted in a refugee camp. For a brief information on my self and my family. But please don't be discouraged for hearing this, where I am living now in the missionary, led by Reverend Father, I used his office computer to send You this letter and I only enter his office, when he was less busy in his office. I would like to know more about you, your love, and your hobbies and what you are doing now, I want to meet understanding, faithful, sincere, truthfully, kindly and friendly, and indeed, a man of vision and truth. I will tell you more about myself in my next mail. Attached here is my picture and as we continue moving ahead, i hope to see you face to face because it is my heart desire and also my wish for you, so expecting your next mail, with some thing good; but until then good-bye. But all the same thank God for your message was a bit relief for me. May God bless and protect you for me, In this camp we are only allowed to go out from the camp only two times in the week, its just like one staying in the prison and I hope by Gods grace, with your help i will come out here soon, i don't have any relatives now whom i can go to all our relatives ran away in the middle of the war.. The only person i have now is Rev. Frankling Johnson who is the Reverend Minister in charge of the church in this camp, He has been very nice to me since we came here but I am not living with him rather I am living in the female hostel because the camp have two hostels one for men the other for female. The Pastors Tel number is (+221781198171) OR (+221-762927238) and his email address is (rv_franklingjohnson@yahoo.com) Feel free to call me through his number, If you call and tell him that you want to speak with me he will send for me in the hostel, As a refugee here I don't have any right or privilege to any thing be it money or whatever to do. because it is against the law of this country. I want to go back to my studies because I only attended my first year before the tragic incident that lead to my being in this situation now took place, i have deposited my trust in you, and i have to make some prayers as regard to this and i am convinced by my God and in my spirit that you are the person destined to help me in my life,Therefore i would not like you to turn me down after depositing all my trust in you. I have a special reason for contacting you, Because of my urgency need of your help i have to give you more information about me with the hope that you will truly help me as i expect, Please listen to this, I have my late father's certificate of deposit and death certificate here with me which I will send to you latter, because when he was alive he deposited some amount of money in a bank which he used my name as the next of kin. The amount in question is $2.5 (TWO Million Five Hundred Thousand US Dollars). i have informed the bank about my plans to claim this money and the only thing they told me is to look for a foreign partner who will stand on my behalf due to my refugee status and the laws of this country. But can i have an exchange of words with you before we proceed,,so i might knows who i am dealing with and all the same i attach my refugee id card for more confirmation by you. I pray that this email will meet you in good health. You may have forgotten me but it my sincere wish to inform you that i have not forgotten you and i can never forget you because you was so nice to me and you tried your best to help me in this transfer and bring me to your country which finally fail because i have waited to hear from you for so long, maybe it is not the will of God. With this alone i believe can remember me. I succeeded in getting a foreign partner from Portugal who helped me in this transfer and now he is planning to invest this money in real estate but everyday of my life i keep on remembering you and it disturbs me so much so i decided to compensate you. Please bear with me. 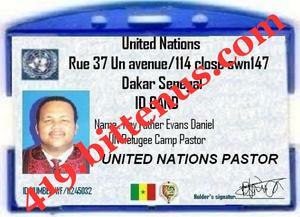 I wasn't able to reach you on phone or even through email before joining my partner because everything was made in a hast so i signed a Cheque of $350.000 (three hundred and fifty thousand United States of American Dollars) in your name which i gave to Reverend Evans Daniel to give you whenever you contact him for the Cheque. His name is: Rev Father. Evans Daniel. Send to him your full name and address and inform him that i ask you to contact him for the Cheque and he will send it to you. I pray that you will read this email soonest and contact the Reverend for the Cheque and this maybe my last email to you because i was warned by my fiance not correspond with you again since him and i will soon get married. I wish you good luck and i pray that this money will be profiting to you because i am giving it to you with all my heart. May the peace of God be with you and your family! As you receive this message, you and your family are bless in Jesus Name Amen. Yes i received a Bank Draft from your former partner Becky Evans who is now married and live with her husband in the Portugal, Your Bank Draft is here in my Office, and i will send your Bank Draft to you through D.H.L, we have Various Services that can go around the world from Dakar Senegal, because it is what my Church Operate with. I will rap the Bank Draft with Magazine Paper and send it through D.H.L Service to enable them deliver it to your door step or to collect it from their nearest office around your area. and i will also know how much there will charge to post the check for you DHL. Meanwhile i want you to send me your full contact information where the item will be send to you. Subject: From Reverend Father Evans waiting for your reply immediately. May the peace of God be with you and your family !! As you receive this message you and your family are bless in Jesus Name Amen. Having acknowledge your Information's, I am now convinced that you are the real beneficiary of the cheque. I was at the D.H.L courier office today to ascertain the cost of sending the cheque and the other gift parcel that your former partner left for you in my office to your country, And they said i must pay delivery fee of 250 Euro, before it can be sent out, they said that the fee must be paid in cash here,before the parcel can be delivered to your door step. Right now, i will like you to send the money immediately with my information below so that i will go and send the Cheque to you immediately i receive the posting fee from you. You are to make the payment through Money Gram transfer for easy pickup or Western Union Transfer, and here are my information's in which you will use in sending the money to me. Please i will like you to send the information which you receive from the Bank to me. Ones i receive the money from you i will go immediately to the D.H.L office here and send the cheque immediately to you. I have already made the inquiry from them and they told me that it will take 3 working days for the package to arrive on your door step with the information you gave to me. You can also give me a call for clarification in any area you don't understand very well through My Office Phone Number. (+221 767479339). I promise to serve you with the fear of God.